Ruth works under veterinary referral and can provide a full report to each animals supervising veterinary surgeon. Ruth can work alongside your vet to design a specialised rehabilitation programme and provide progress reports. During her training Ruth spent time in a variety of yards in both Ireland and the U.K. treating racehorses, dressage horses, showjumpers, showing horses, agility dogs, working trial dogs and show dogs. Ruth has also trained extensively within the veterinary hospital in University College Dublin. Ruth produced a thesis during her training which focused on the impact of physiotherapy on the posture of the horse. The results of this study will be published and show that physiotherapy treatment has a very significant impact on the posture of the horse. 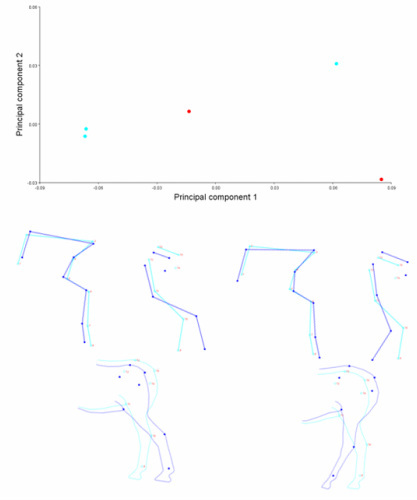 Figure: Principal component analysis illustrating the average shape changes (dark blue lines) before (blue) and after (red) physiotherapy treatment.